Learn to dive and explore the aquatic realm - Become an Open Water Diver! The feeling of gliding effortlessly over stunning coral reefs and encountering wonderful aquatic marine life is not a dream anymore when you enroll in the PADI Open Water Diving Course with us here at Go Pro Diving. This will be your first step towards a lifetime of underwater exploration. The theory is achieved through the PADI e-Learning program which allows you to login in to your account on-line and complete all the theory in your own time - there is no need to spend valuable time in a classroom whilst on vacation! To get started, purchase your eLearning Access Pass by visiting our website www.goprocayman.com and clicking on the e-learning button in our homepage. Once on the island you will begin to learn the practical skills in the confined water of the swimming pool before progressing to the open water portion of the course. The confined water training takes place at Cheeseburg Reef and The first two "check- out" dives are taught as shallow shore dives. The following day you will finish your course with two more shore dives. After certification you will be qualified and well prepared to experience even more of the Cayman’s wonderful and diverse underwater world. We offer this course a number of times weekly at your convenience. 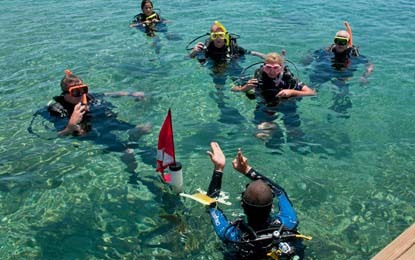 Certified divers are encouraged to join family or friends enrolled in this course. The PADI Open Water Diver certification is the most widely recognized and respected scuba diving rating in the world. This qualification will give you the skills you need to safely enjoy this adventurous activity. As a certified PADI Open Water Diver you are able to dive with a buddy, without the supervision of a PADI professional. 10 years oldor older, medically fit to dive and be comfortable in the water. Please review the PADI Medical Questionnaire prior to enrolling in any PADI training course. If you answer "YES" to any of the medical issues it does not necessarily disqualify you from Scuba Diving - it just means your pre-existing condition could possibly affect your safety while diving and you must seek your Physician's approval to dive.